Shane Nelson, a two-year member of the Blue Stars, sent this picture. I marched with the Blue Stars in 2004 and 2005. Sadly I can no longer do junior corps because of a scheduling conflict with the National Guard band that I am in. The scheduling works out great for senior corps though, so I am currently with Minnesota Brass, Inc. 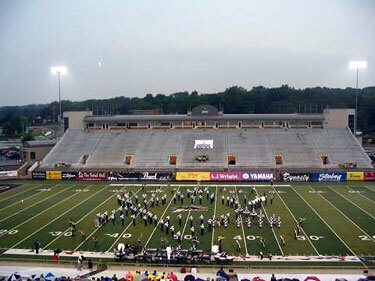 This is a picture of the 2005 Blue Stars taken in Kalamazoo, Mich. I will always remember the two greatest summers of my life with the Blue Stars.